Ellis talked about the Margin vs Velocity Mental Model, explaining that because “margin is what we know and it comes naturally to us,” companies tend to focus too much on margin. According to Ellis, “in a resource-constrained environment, collaboration trumps adversarial cost-based selection every day of the week.” Rather than focus on ‘more work’ and margin, build strategic relationships with suppliers and customers. “Instead of asking for more, ask ‘how are we doing? '” advised Ellis. Understand that employee engagement drives customer experience which drives business results. 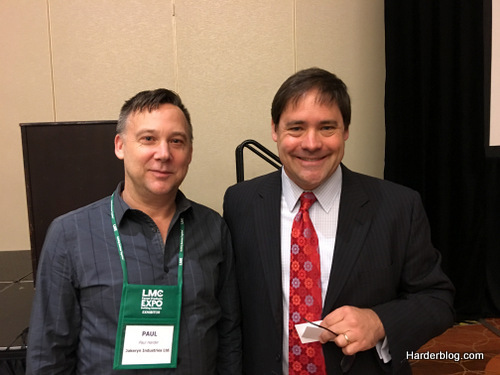 The 2016 LMC Forest Products and Building Materials EXPO was brimming with lumber dealers feeling upbeat about 2016 to date and bullish on 2017. However a number acknowledged significant business was pulled forward/covered in advance of the October 12 standstill expiry. Moderating activity since that time also helps to explain the present supply-demand imbalance. The skittish tone and extreme hand-to-mouth buying patterns in evidence suggest dealers, wary of winter and working down inventories for year-end, are perhaps content to “run out the clock” on a good year. This entry was posted in General Interest, Industry and tagged housing market, lumber, marketing, US housing market. Bookmark the permalink.